SKY MAP: The scene at 10:30 p.m. local time from mid-northern latitudes. It's a fact: thumb through most astronomy books or sky watching guides and you'll find all the accolades going to the most brilliant and splashy star patterns such as Orion, the Hunter, Scorpius, the Scorpion or (for southern observers), the region around Crux, the Southern Cross. In contrast, the small, faint star patterns usually get short shrift. Yet, there's one pattern that I always look for, partly because it serves as an excellent gage for determining the quality of the night sky, and partly because it serves as a "pointer" to one of the summer's best deep-sky objects as well as a striking little star cluster nearby. During this upcoming week, as the bright Moon finally moves out of the evening sky, this will be a good time to hunt these objects down. On most star charts Vulpecula, the Little Fox seems to be nothing more than a formless splattering of dim stars. But the late Dr. Hugh Rice, who, nearly 60-years ago used to work at New York's Hayden Planetarium, showed part of this group on his star maps as something resembling a cowboy boot. The boot even boasted a spur that many cowboys wear. Involving mostly faint stars, Rice's pattern ironically doesn't include this constellation's brightest, Alpha Vulpeculae. The average visual magnitude of the twelve stars that compose the boot is 5.0, so when all the stars in this celestial shoe are visible with the unaided eye, you know the sky is transparent and your observing conditions excellent. Sighted in wide-field binoculars or a telescope's viewfinder, Rice's pattern helps us locate the beautiful Dumbbell Nebula (M27). Picked up with very low power as a glowing bubble encompassing two hazy patches of light; it assumes a dumbbell appearance in larger telescopes. The name "Dumbbell" was, in fact, derived from the description by Reverend T.W. Webb (1807-1885) of "two hazy masses in contact." Most amateur astronomers have heard of such beautiful open star clusters as the Pleiades, Hyades and the Beehive. 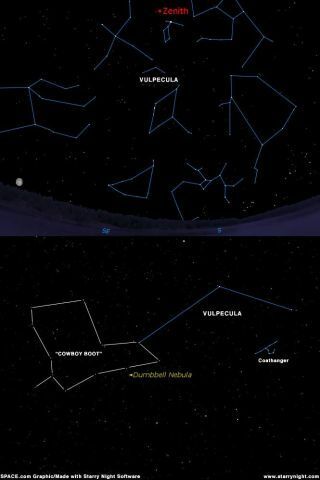 Yet few have ever heard of the "Coat Hanger" But if you turn your binoculars to the region of the sky roughly halfway between the bright stars Vega and Altair and you will discover this intriguing group of stars for yourself. It is not far too away from the Cowboy Boot. For some reason that I have never been able to fathom, the Coat hanger Cluster is rarely mentioned, if at all, in most popular astronomy books. Yet, it is the brightest of all the star clusters in this part of the sky! I accidentally stumbled across it more than 30 years ago while sweeping up and down the Milky Way with 7 x 35 binoculars. Actually, my original impression of it of it resembled some sort of a ladle (and since I was visiting my Aunt Irma when I made the discovery, I unofficially christened it "Irma's Ladle"). Others have seen it as a rather curious grouping of about a dozen tiny stars looking very much like an inverted coat hanger. However . . . it's really a proper coat hanger only for Southern Hemisphere observers, where it appears right side up. In a clear, dark sky you might even perceive it with the naked eye as a fuzzy patch of light. This is one object that is best suited for your binoculars; even a small telescope with low power will provide too much magnification and will cause the stars to appear too widely spaced apart.